DOVER, NH--(Marketwire - October 12, 2010) - Relyco, a leading provider of value-added business printing solutions, business equipment, and check printing solutions, today announced that the company added more than 400 new customers in the third quarter of 2010 -- a result of new sales and marketing initiatives, and the rollout of its REIMAGE™, REVLAR™, and ULTRASEAL® products. Relyco continues to grow quarter over quarter as the company builds upon its reputation as a leading provider and innovator of business printing solutions. In Q3 2010, Relyco significantly increased its customer base and expanded existing business across all vertical markets for its entire line of products. Some notable new customers included Halliburton International Foods, CITGO Petroleum Corporation, Payless ShoeSource, Wyndham Hotels and Resorts, Navistar, BASF, and many federal government agencies. "With the customer growth that we're experiencing, I believe we're starting to see a positive turn in the economy, which is a great sign for our business," said Mike Steinberg, president of Relyco. "Our third quarter was very successful beyond what we accomplished from a sales perspective as we launched a completely new website and embarked upon a major overhaul of our internal systems and processes. These advances have us well positioned to close out the year on a high note." Within Relyco's three primary product groups (Laser Check Printing Solutions, Self Mailer Pressure Seal Forms, and Innovative Laser and Digital Forms), the company delivers ultimate quality and performance to its customers at the best possible price. Whether a customer is looking for a custom or stock item, Relyco works with each customer to provide solutions that best meet their business printing needs. Contact Relyco by calling 1-800-777-7359 or emailing info@relyco.com today to learn more. 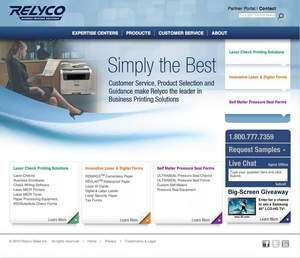 Relyco is a leading provider of value-added business printing solutions, business equipment, and check printing software with over 10,000 customers worldwide. As one of the largest distributors of laser and digital applications, including laser checks and other high-security documents, Relyco's long-standing membership in the ASC X9AB check processing committee and extensive experience with fraud prevention strategies and new forms technologies positions it as the most innovative leader in the business printing solutions field. Relyco's customers include Google, J. Jill, PepsiCo, Samsung, Adobe and Microsoft. For more information, please visit www.relyco.com.